Freedom of speech comes with responsibility. Although La’o Hamutuk opposes legal measures which could restrict discussion, we urge all political observers - including journalists, academics and bloggers, particularly non-Timorese who write from a distance - to remember that they should consider the repercussions on the Timorese people when they use their freedom of speech. La’o Hamutuk (the Timor-Leste Institute for Development Monitoring and Analysis) was founded on the principle that internationals and nationals work together to advance social justice in Timor-Leste, and we therefore offer this suggestion to the country’s international friends. Two recent blog articles circulated on social media and focusing on political leaders exemplify unconstructive and irresponsible commentary. One lambasts President Lu Olo with sensational accusations of constitutional abuse, while another compares Xanana Gusmão’s relationships with women to Donald Trump. Political leaders should be held to a high standard, and no leader’s actions are above criticism. That said, commentary should be evidence-based, consistent with basic principles of journalistic ethics, and constructive. Speculation, unnamed sources, personal attacks and inflammatory language are not helpful. Additionally, debate about Timor-Leste should focus on policies, not personalities. In the wake of recent political events, this country needs commentators, political leaders and citizens to focus on the programs that will shape the next five years and beyond. Outside perspectives can improve debate by bringing in additional experiences and information; they also have consequences. People who read these articles should also exercise judgment about their accuracy and helpfulness, and think twice before circulating or reposting them. We all share responsibility to try to reduce polarization, personal attacks and counter-attacks, and partisanship. These add unnecessary challenges to the difficult task of improving the lives of Timor-Leste’s people, who have already suffered greatly from outside intervention. Overseas authors may not experience the negative impact of their writings, but the Timorese people will live with the consequences. Authors who care about this beloved country have a moral obligation to contribute in a positive and constructive way. For centuries, Timor-Leste was ruled by foreign governments who ignored the needs and desires of our people. Now that we are independent, we need to change our approach from resistance to encouragement. Please join us in the spirit of constructive debate, persuasion and collaboration which can move our country forward. Loron-sesta, 20 fulan-jullu mak sai loron okupadu ba Parlamentu no Governu foun. Hafoin hadau malu no la ko’alia ho konstrutivu ba asuntu xave sira, Parlamentu aprova lei dahuluk (lia-portugés ka lia-inglés) husi mandatu foun lejizlativu nian. Nune’e sira autoriza transferénsia husi Fundu Petrolíferu hodi uza ba operasaun mákina governu to’o bele aprova Orsamentu Estadu tinan 2018 nian. Haree pájina web La’o Hamutuk nian hodi hetan informasaun tan. Iha loron hanesan, Konsellu Ministru sira aprova Programa Governu ne’ebé fahe iha Parlamentu. Ami enkoraja Membru Parlamentu sira, sosiedade sivíl, sidadaun no observadór hotu atu lee no analiza dokumentu ne’e ho pájina 135, tanba programa no projetu sira ne’ebé hetan deskreve iha laran mak sei sai matadalan ba futuru Timor-Leste nian. La’o Hamutuk publika ona programa sira ne’e no bele hetan iha La’o Hamutuk nia pájina web ida-ne’e. La’o Hamutuk espera katak diskusaun kona-ba programa ida-ne’e sei haree asuntu importante sira no sai konstrutivu liu kompara ho debate iha Parlamentu iha loron-sesta kotuk. Kuaze Timoroan hotu la’ós polítiku-na’in, maibé sira sidadaun baibain ne’ebé sei simu impaktu husi desizaun polítika, programa no asaun husi ofisiál sira-ne’ebé hetan fiar povu nian atu serbisu ba interese públiku. Programa Governu mak oportunidade atu ema hotu bele konsidera, diskute no deside ba dalan ne’ebé di’ak liu ba dezenvolvimentu ekitável no sustentável ba ita-nia nasaun tomak. Friday 20 July was a busy day for Timor-Leste’s new Parliament and Government. 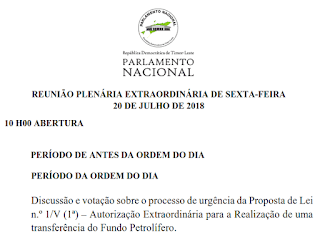 After a long day of partisan squabbling, Parliament approved the first law of the new legislative term, authorizing a transfer from the Petroleum Fund to fund government operations until the 2018 State Budget is passed. See La’o Hamutuk’s web page for more information. Also that day, the Council of Ministers approved the Government Program (Tetum or Portuguese) and circulated it to Parliament. We encourage the Members of Parliament, civil society, and all citizens and commentators to read and analyze this 130-page document carefully, as the programs and projects it describes will set the direction for the future of Timor-Leste. La’o Hamutuk has posted the Program (with partial, unofficial English translation) on a web page. La’o Hamutuk hopes that discussion of the Program will be more substantive and constructive than the Parliamentary debate last Friday. The vast majority of Timorese people are not politicians, but are ordinary citizens whose lives are affected by the policies, programs and actions of the officials whom they have entrusted to act in the public interest. The Government Program is an opportunity for everyone to consider, discuss and decide on the best pathways toward equitable, sustainable development for the entire nation. Ohin dadeer, sei iha plenária estraordináriu iha Parlamentu Nasional atu debate no deside kona ba proposta lei husi Governu ne’ebé autoriza transferénsia tokon $140 husi Fundu Petrolíferu atu finansia atividade estadu sira ba Jullu no Agostu. La'o Hamutuk suporta proposta ida ne'e, tanba proposta ne'e la halo mudansa ba lei sira ne’ebé estabelese tiha ona. Bele le'e liu tan kona ba asuntu iha ne'e. 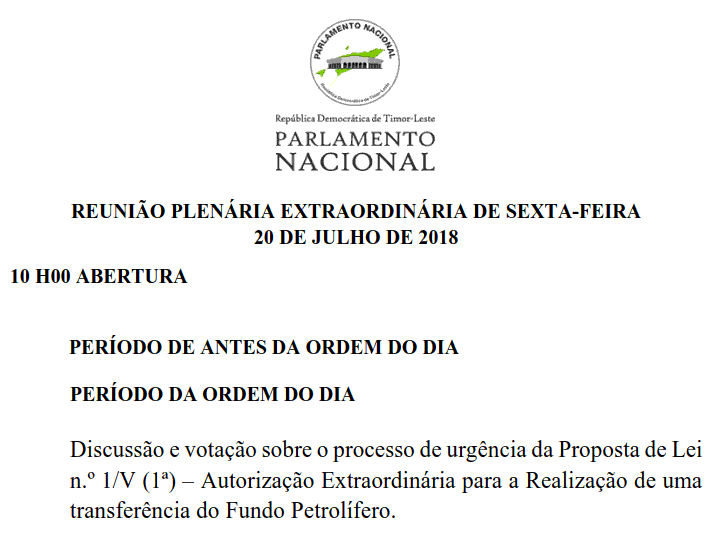 This morning, an extraordinary Parliamentary plenary meeting will debate and vote on Government's proposal to authorize a special transfer of $140 million from the Petroleum Fund to finance state activities during July and August. La'o Hamutuk supports this proposal, which does not change existing laws and complies with the letter and the spirit of Timor-Leste's solid system for managing money from oil and gas exports, as well as with recommendations we recently discussed with Parliament. The proposed law, with explanatory materials, is here in English or Portuguese. Read more about this issue and our analysis.